This home use to be beach front. The storm in 1962 left it in the condition seen in the old photo. It was then moved safely to it's current location. It has been fixed up nicely in recent years, last photo. On the corner of Commonwealth & Willard, at the blinker light - This restaurant was built from the remnants of the West Jersey Cottage's main hotel, which was dismantled and moved after it suffered damage from the 1944 hurricane. 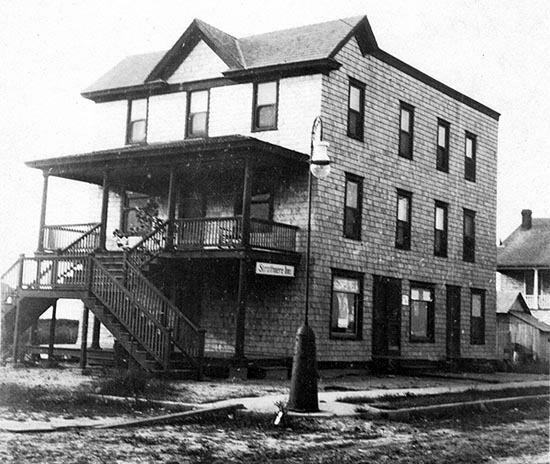 On the right is how the building looked in 1902, when it was still the West Jersey Cottage on the bay at Winthrop. In the 1960s, it was known as Harker's Corner and it was a luncheonette and gas station. It the 1970s and 1980s it was known as Ernie's. 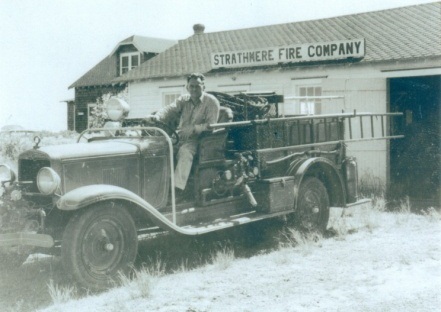 The Strathmere Volunteer Fire Company is the oldest fire company in Upper Township. It was founded in 1924. It has always been located at 5 South Commonwealth, but the building has, of course, undergone changes over the years. The fire company has 3 fire trucks and a First Responder vehicle. 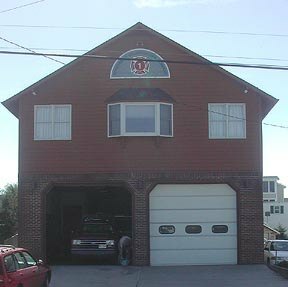 It acts as First Responders on all medical calls and assists Sea Isle Ambulance Corps. It is part of Upper Township Emergency services. The company watches over the homes in Strathmere, and it helps run the 4th of July parade. 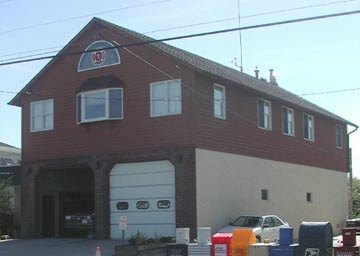 The fire hall is rarely rented because it is the meeting place for 2 organizations in Strathmere and kept available for emergency shelter. Then in the 1920's, Mr. & Mrs. Corson took over the post office and it was housed on Commonwealth, next to the church. 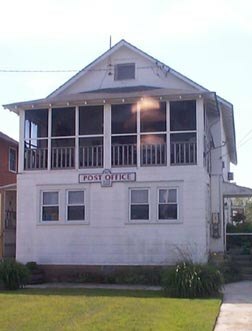 Later the post office was briefly housed on Willard, on the bay side. Then it moved to it's present location, with Gogsie Wittkamp as the post master for many years. 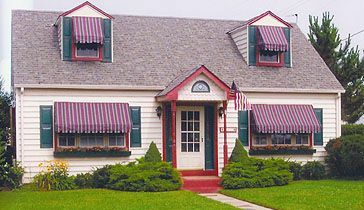 This Commonwealth home once housed the post office in Strathmere, around the 1940's. 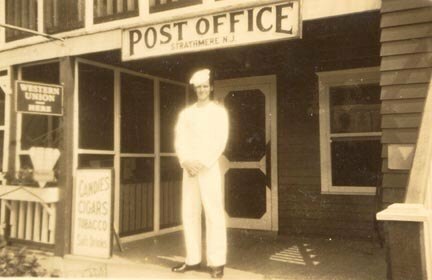 The old picture shows Varnell Gentle in front of the post office housed here in 1942. In 1916, a group of citizens met in the home of John L. Smith (Schmidt) on Vincent Rd, to organize a church. 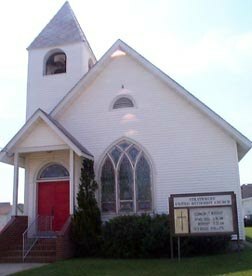 The First Methodist Episcopal Church of Strathmere was incorporated on June 1, 1922. On June 22nd, 1922, Mr. W.A.P. Thompson & wife Maude gave the church land to build on for the cost of $1.00. In November 1923 another piece of property was sold to the church by the Thompsons for the cost of $310.00. Following WWII, Chief Petty Officer, US Coast Guard, Louis P. Carmona & his wife Katherine, looked after the church.After Mr. Carmona's death in 1986, Katherine continued to care for the church. Presently a Board of Trustees manages the church. In the beginning, church services were held year round. But they are currently held from Memorial Day to the end of September, with special services for Thanksgiving, Christmas & Easter. 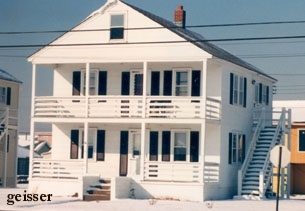 The Geisser's House on Commonwealth, when they first purchased it, and in recent years. 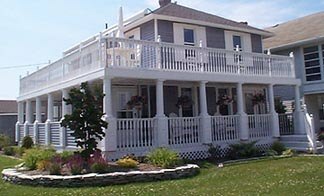 The Cordrey home was built on the bay side of Commonwealth in 1956. 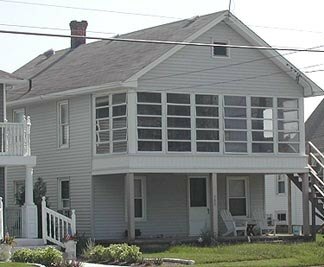 The house sits on the corner of Vincent & Commonwealth Ave., and was originally built by John Keese (Chief Petty Officer, USCG, Retired - Deceased). Construction was begun in 1952, and completed in 1956. 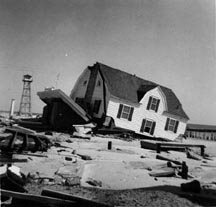 John, his wife Pauline, and their four children (Rita Lee, Carl, Darlene, and Rhonda), lived in the house until shortly after the storm of 1962. They sold the house in late 1962 and moved to Florida. Since then, the house has been slightly modified from its original design with a small portico added to the front entry porch, and the removal of the entry door on the Vincent Ave. side of the house. A very nice back deck and utility shed has also been added. 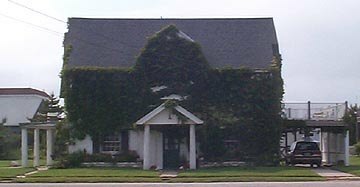 The house next door (south side), was also built by John Keese for his sister-in-law, Sylvia Pizza, and her son, Dino. The Pizza's also sold their house after the 1962 storm and moved to Florida. Major remodeling has been made to this house. The front entry door and porch have been removed, a complete second story has been added, and a "widows walk" added to top of the house. A full deck has been added to the rear of the house, along with a couple utility sheds. This building was built in 1910 by George & Catharine McCullough. The property was given to them as part of a building promotion in Strathmere. They could have the property as long as they agreed to build and run a food store for local residents and for those building homes in Strathmere. 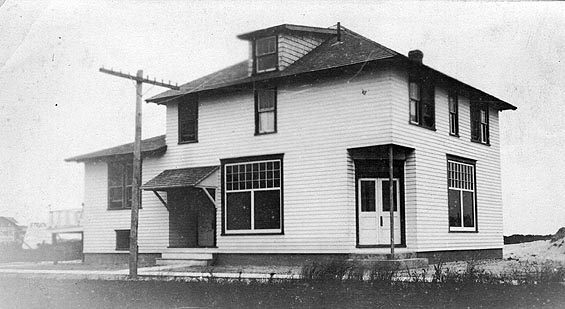 It was the original general store n Strathmere, it also housed the first post office and George was the first postmaster. The couple and their 6 children lived on the 2 upper floors. Catharine learned to butcher meat, and she would take the trolley to Sea Isle to buy wholesale produce to sell in the store. The trainlines ran weekend fishing excursion to Strathmere full of fishermen. Catharine made sandwiches for the men. In the early 20's the McCulloughs sold the store to the Pfeiffers. 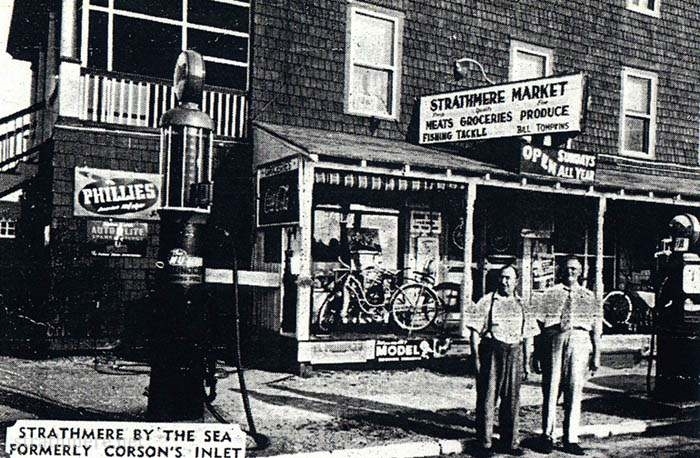 The 2nd old was taken later, maybe in the 1940's, when it was called the 'Strathmere Market' and at this time it was owned by Bill Tompkins, who is the man on the left in the photo. Check out the old manual gas pump, which reportedly wasn't very accurate! The Strathmere Motel - can you believe that the Strathmere Motel started out as this building? The house was bought by the McCullough family around 1923. The first photo shows how it looked shortly after it was built. The 2nd photo shows it when it was occupied by the McCulloughs and their 6 children, and after the front porch had been added. They also ran the town post office out of this home. The door to the Post office was on the side of the house, facing Commonwealth. George also had offices here for the 'Strathmere Real Estate Companty' and for the 'Strathmere Building & Loan Assocociation', both of which he founded. 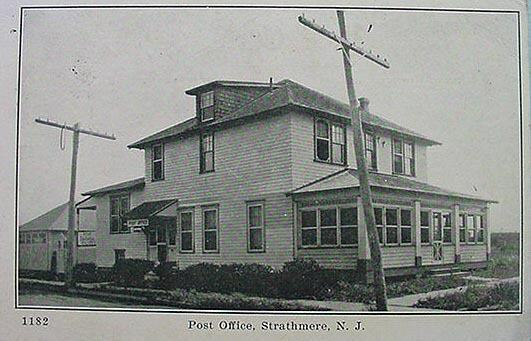 In 1934 there was a new postmaster, and the post office moved out of this home to northern Strathmere. George & wife Catharine continued to run their businesses here until George's death in 1948. In 1951, the home was sold. 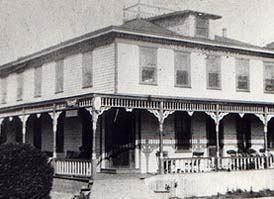 The old building was bought in the 1950's by the Panunto family who owned the Bayview Motel. 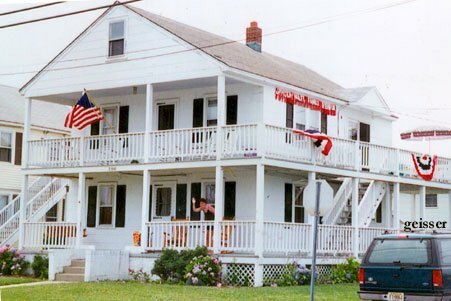 They removed the peaked roof and attic and had the front expanded, making it the building that is now the Strathmere Motel. The Panunto Family read the history of this family's time in Strathmere. 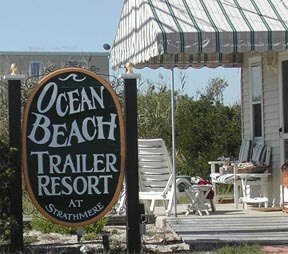 Ocean Beach Trailer Resort - You know Summer is coming when you start to see the trailers pulling into their lots! 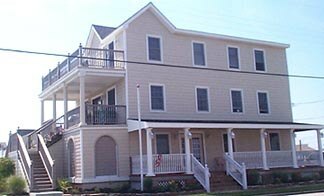 This mini community within Strathmere is summer home for 99 seasonal renters every year. It has been owned and run by the Schroder family for 20 years. Photos were taken in 2002 and 2013.